People are talking ferry again. 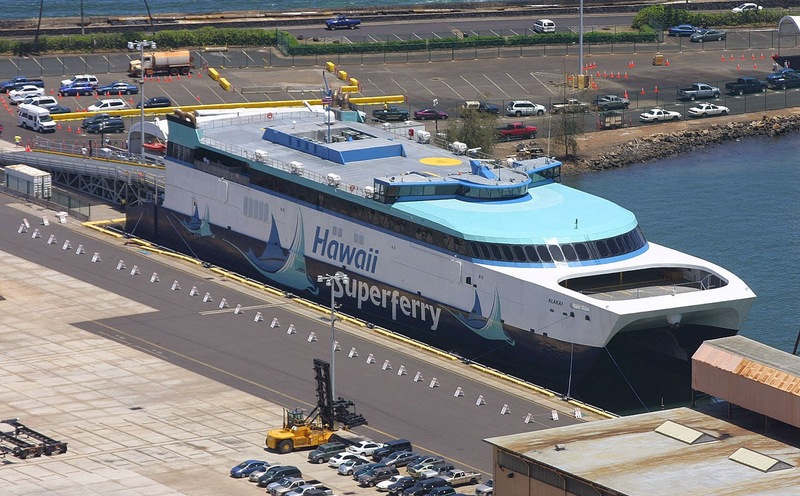 The first Hawaiian Inter-Island Ferry Conference to explore pros and cons of Hawaiian Inter-Island Ferry systems is scheduled Oct. 6 in Honolulu. Recent online polls showing 80 percent in favor of ferry service prompted the Marine Engineers’ Beneficial Association, and the Master Mates and Pilots, to organize six speakers at the five-hour town hall meeting. Garden Island. With the primary election over, it's now a three-way race for governor. And some experts believe the race is closer than recent polls suggest. In the latest Hawaii News Now/Honolulu Star-Advertiser Hawaii Poll, Republican Duke Aiona is the front-runner in a three-way race with 41 percent of the vote, followed by Democrat David Ige with 34 percent and independent Mufi Hannemann with just 15 percent. Hawaii's economy is expected to grow faster this year than previously forecast after inflation remained mild during the first six months of 2014. The state revised upward its growth forecast on Wednesday and projects Hawaii's inflation-adjusted gross domestic product, the broadest measure of economic output, to rise 2.6 percent this year, up from 2.4 percent in its May forecast, according to a quarterly report released by the state Department of Business, Economic Development and Tourism. Star-Advertiser. State economists are expecting 8.3 million visitors to spend $14.9 billion in Hawaii this year, which would set a new record. The Department of Business, Economic Development and Tourism’s third-quarter report, released Wednesday, revises Hawaii’s economic growth upward. Civil Beat. Across the islands, 1 out of every 5 Hawaii residents depends on food aid from the Hawaii Foodbank and its network of agencies, a new report reveals. That's well above the national average of 1 in 7 people relying on food banks and feeding programs. Star-Advertiser. Funding for vacant special-education services positions at public schools could be cut by more than $9 million under a preliminary plan the state Department of Education is working on as it braces for a reduced budget allocation from the state. Star-Advertiser. Mark Takai and Charles Djou have much in common. They’re middle-aged family men who grew up in Hawaii, serve in the military and have years of experience in elected office. But there are fundamental differences between the two candidates that will help urban Oahu voters decide Nov. 4 who they want to represent them in Congress for the next two years. Civil Beat. Aircraft facility named after late U.S. Sen. Inouye. KITV4. Hawaii’s health-care exchange, the Hawaii Health Connector, has taken another blow. Hawaii Medical Service Association, the state’s largest health insurer, won’t participate in the Connector’s Small Business Health Options Program, or SHOP, as of January. Hawaii Reporter. The University of Hawaii athletic department says it is targeting a 5 percent cut on operational budget line items in an attempt to help rein in its projected deficit for the current fiscal year. Star-Advertiser. The state is wading into a touchy turf war that's pitting stand up paddlers against surfers and bodyboarders. A group called Safe-Surf Hawaii is proposing a one year pilot program. The program would ban stand up paddle boarders from all surf breaks between Ala Wai boat harbor to Kewalo Basin. Hawaii News Now. Organizers bringing a circus to Honolulu say the show will not feature animals as previously planned. People for the Ethical Treatment of Animals protested against the Moscow International Circus' plans to include animals during Honolulu shows in October. Associated Press. A politically connected pumping company will be allowed to keep a baseyard it built in a Hilo neighborhood that’s zoned residential, despite constructing a five-bay industrial warehouse after getting a permit for a single-family home. West Hawaii Today. While Tropical Storm Iselle apparently didn’t cause any serious injuries, some lower Puna residents think the same cannot be said for the steam release that occurred at Puna Geothermal Venture while they were hunkering down for Iselle’s arrival. The release, which included hydrogen sulfide, occurred the evening of Aug. 7 when the 38-megawatt plant was cut off from transmission lines and shut down. Tribune-Herald. A total of 260 Hawaii Island residents reported sustaining damage to their homes as a result of Tropical Storm Iselle, according to the Hawaii Emergency Management Agency. Tribune-Herald. Hawaii Electric Light Co. continues to restore electric service to customers who lost power as a result of Tropical Storm Iselle. However, the company said in a prepared statement Wednesday that it could take another two weeks — in some cases, even longer — to restore power to all affected customers. West Hawaii Today. Unemployment is dropping, while business is increasing, state Department of Business, Economic Development and Tourism officials said Wednesday. In the department’s third quarter 2014 statistics and economic report, officials said Hawaii Island’s unemployment rate dropped from 7 percent to 6 percent between the first part of 2013 and first quarter of this year. At the same time, Hawaii County had the second-highest increase in building permit values in the first quarter of 2014, a $13.8 million increase, or 16.2 percent. West Hawaii Today. Things may be looking up for the critically endangered palila, the small songbird with a yellow head found only in the wild on Hawaii island. Star-Advertiser. Donations Pour In to Influence GMO Debate, But Are They Being Disclosed? No ballot issue committees have formed to raise money for or against the proposed Maui County GMO ban on the fall ballot, but a lot has been spent on political candidates. Civil Beat. Maui Mayor Alan Arakawa joins his administration in hosting a series of community meetings in September and October to receive public comment on the fiscal year 2015-2016 budget. Maui Now. Three ranking Maui Police Department officers and three retired police officers from Maui, Honolulu and New York are the six finalists who will be interviewed for the job of Maui County police chief. Maui News. A special committee tasked with reviewing applications for the Maui police chief vacancy has narrowed the list to six finalists and has released the names of those still in the running. Maui Now. Former Maui County mayoral candidate Nelson Waikiki Jr. will be out of jail and placed on supervised release again, after police arrested him following a candidate forum at Seabury Hall in July. Maui News. A Kauai photographer is suing Canadian music star Justin Bieber and his bodyguard for assaulting him and destroying his camera at Shipwreck’s Beach in November. Garden Island. A photographer who says he was assaulted by Justin Bieber's bodyguard on a Hawaii beach last year is suing the pop singer for assault and negligence. Associated Press. County of Kauai officials are moving ahead with a new waste management program that would charge residents based on how much they throw away, though some have concerns. Garden Island.